Armstrong's esteemed works, including such standards as A History of God and The Battle for God, have primarily focused on the monotheism of the Middle East. Now she turns farther eastward to craft this short biography for the Penguin Lives series. 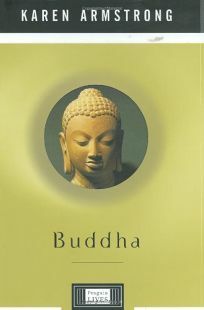 Armstrong carefully ties the Buddha's time to our own and champions his spiritual discoveries with an understated dignity that even the Buddha might bless. While exercising a scholar's restraint, she reveals a detectable compassion for Sidhatta Gotama, the radical who walked away from a pleasure palace because he refused to ""remain locked in an undeveloped version"" [of himself]. Armstrong overcame peculiar challenges to write about this historical figure who became ""a type rather than an individual,"" as his personality and life particulars evaporated into the power of his selflessness. She turned this lack of details for a conventional biography to our advantage, opting to enhance Gotama's story with the broad canvas of his time and culture, thus making him accessibly human. This handsome and solid portrait is sure to become a classic; it is a refined and readable biography of a pivotal character in human history. It is likely true that when the 80-year-old Buddha died he had, as the sutra says, ""gone beyond the power of words,"" but in this thoughtful and revealing study, Armstrong has come near to proving the scriptures wrong. (Feb.) Forecast: Despite the plethora of Buddhist books on the market, few recent Buddha biographies have been written for a general audience. Armstrong's superb reputation should help sales, and Viking plans a six-city author tour and national publicity.